Works on paper and paintings by one of the UK's most exciting equestrian artists. "These are less horses than forces running out of control." Rachel Campbell-Johnson. Jo Taylor works in a variety of media on a large unrestrictive scale and her style is deliberately abstract with a bold use of colour. Her organic palette is scoured from the immediate landscape and the elements, reminiscent of the work of Prunella Clough and Graham Sutherland. Through her materials she describes muscle tensions and structures, which she was able to study during her residency at the Department of Veterinary Science at Liverpool University. This left Jo with an exceptional knowledge and understanding of animal physiology, leading The Times Art Critic Rachel Campbell Johnson to liken her use of anatomy to Stubbs. 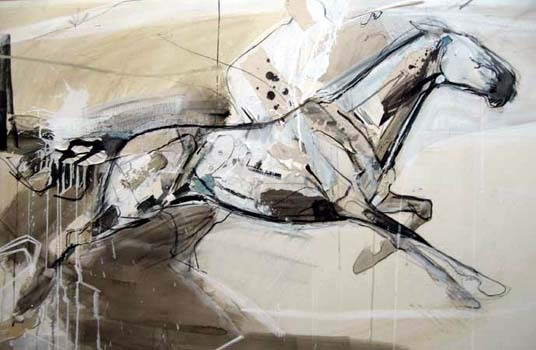 These insights give Jo an understanding that is translated into paintings which contain a sculptural dynamism where the essence of the horse is exposed.